Watch the Millionaire TV Show and answer the simple question at millionairetv.com for your chance to win a trip for two to Bally’s Las Vegas Resort and Casino. 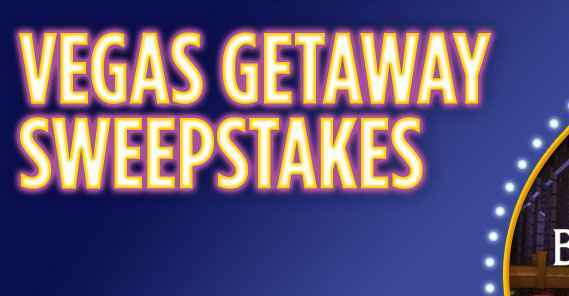 The The Millionaire Getaway Sweepstakes is open only to legal residents of the fifty (50) United States and the District of Columbia who are twenty one (21) years of age or older at the time they enter the sweepstakes. The sweepstakes starts on January 8, 2018 at 12:01 am Eastern Time (“ET”), and ends on May 28, 2018 at 12:00 am ET. One (1) Entry per person per each Individual Entry Period for a total of twenty-one (21) Entries per person per Drawing Period. One (1) prize will be awarded for each Drawing Period. Each Drawing Period prize winner will receive a three (3) day/two (2) night trip for two (2) to Las Vegas.